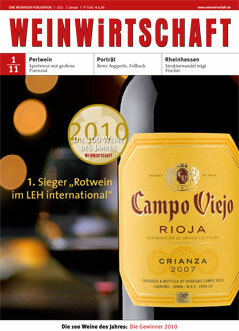 The German wine journal Weinwirtschaft just released its list of the top 100 wines of the year 2010. It is a bit like the Wine Spectator Top 100 list: the best wines are not the qualitatively best wines, but the best wines according to a combination of several criteria: (1) the tasting results, (2) the price-quality-ratio, (3) how the wine sells and (4) the marketing efforts of the wine producer. This year, a total of 550 wines competed for the 100 top spots. 40 white wines and 60 red wines made it to the list. They convinced with top quality, good price-quality ratio, a clear retail structure and example-setting marketing. Only wines that sold more than 10.000 bottles in 2010 were included in the contest. That of course left the many smaller top wine makers out of the rating. Overall, the list is dominated by Old World wines. The German consumers continue to be hesitant to buy New World wines, lead by the assumption that mother nature plays a much smaller role in growing and making the wine in the New World than in the Old World. Not a single wine from the US made it to the list, although I typically find inexpensive American wines on the shelves of the large supermarkets when I am in Germany. Perhaps the importers of American wine did not submit their wines. Spain and France are on the 2nd and 3nd place, respectively, with an somewhat improved showing this year compared with the previous year. 10 red wines from each of both countries are now on the list of red wines. Germany improved from 4 red wines last year to 6 red wines this year. With this improvement, Germany now accounts for 10% of the wines on the red wine list. The top German red wine is the 2008 Blauer Pinot Noir from Weingut Knipser (Pfalz). For the white wines, it is just the opposite. More than 50% of the winning white wines come from Germany. The top white wine of the year award went to the 2009 Saar Riesling from the Weingut Van Volxem in Wittingen (Mosel). Second is the 2009 Schloss Johannisberger Riesling Silberlack Grand Cru by Fürst von Metternich-Winneburg'sche Domäne in the Rheingau. Third is 2009 Riesling Deidesheimer Paradiesgarten Dr. Deinhard Kabinett dry from the Pfalz Weingut Von Winning. The list reflects the wine consumer behavior in Germany well. For white wines, you go for German, in particular Riesling, wines. For red wines, you look to other European countries, in particular Italy, France, and Spain. Prices are in Euros. 1Euro = 0.86BP = 1.36US$. The complete list of the Weinwirtschaft Top 100 Wines 2010 of Germany can be seen here.